Last month, The Psychologist carried extracts from a new book called Scientists Making a Difference. I was one of the contributors, and you can find my chapter as an online extra. In it, I discuss my most noted contribution to psychology, and of course it’s lovely to be in the midst of such eminent company. But will I be remembered when I’m gone? Will any of us? Here is a test that may shock you. Try it on a graduate class, an introverted seminar group, or a conference meeting. Ask people: ‘Who would you nominate as the most important psychologist of all time?’ Having done this a few times I have noticed the following. People do not know who is alive or dead. Few name any female psychologists. Americans have no idea there are any European psychologists. Older people recall quite different, even obscure people. 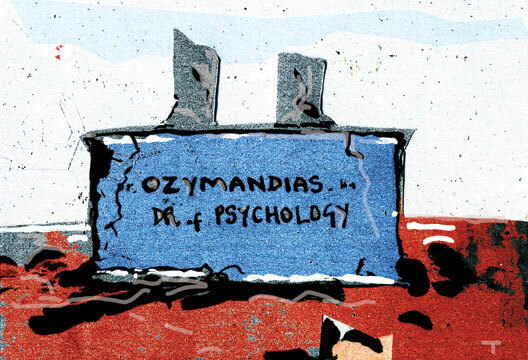 Academic psychologists are blinkered by their own specialisms. Most are pretty incoherent about the criteria they used. But perhaps most interestingly, there are very few truly ‘famous’ psychologists, dead or alive. Fame, at least academic fame, is extremely capricious. Both my wife and I had very famous supervisors when at Oxford. Both have been dead around 15–20 years and both almost forgotten. Donald Broadbent, a brilliant experimental psychologist, would be horrified to learn that his most quoted paper is one published in a clinical journal on ‘correlational psychology’, namely his Cognitive Failures Questionnaire. And take a look at Thorndike’s 1955 article where American Psychological Association fellows were asked to nominate the psychologists who had most made a contribution to the discipline. Half at least are names few could now recall. Of course, fame is a fickle animal and I am not advocating its pursuit. But perhaps increasingly in our social media, image-driven world, it will be possible to achieve notoriety. We need to be able to distinguish this from a lasting legacy based on merit. Just as one can distinguish between leader emergence (the ability to stand out) and effectiveness (do a good job), we can perhaps better assess who is good at ‘acquiring fame’ and who genuinely deserves it. Simplicity: The book should have a key concept/process/tool that solves all problems, supported by plenty of memorable anecdotes, vignettes and stories. Changeability: Stress that human behaviour is (relatively easily) changeable, if (and only if) your magic pill is swallowed. The individual is the key: You must be psychological (not sociological) in your focus on people, underplaying organisational, economic and political factors that self-evidently shape our world. Pretend that you change everything by changing individuals,by making them more emotionally intelligent, engaged or agile. Control: There may be a lot of talk about autonomy, empowerment and the like, but it is the agenda of the managerial and ruling elite that is all-powerful. List of steps and principles: Provide a road map, a paint-by-numbers approach, a flowchart which becomes the title of each chapter. Universality: No multicultural or diversity stuff in a bestseller – the idea is that the secret formula works everywhere for all groups and for all time. After all, you want world sales. Short-termism: The book must claim or demonstrate some short-term payoff or benefit (‘quick win’). Think diet books. Success stories: Provide lists of happy customers… can be your friends or clients, or just ‘made up’ folksy tales of people who followed your advice and went from darkness into light; poverty to wealth; gloom to unbridled happiness. Self-confirmation: The book must not be counterintuitive. Self-confirming approaches endorsing prior ideas and beliefs are essential. Here is the rub: the book should not have radically new ideas. Best repackage common sense but using the metaphors and catchphrases of the day. Unitary perspective: Stress that all stakeholders have ultimately shared goals and mutual benefits from applying your brilliant and deceptively simple ideas. If you’re ever waiting at an airport, see how many authors have followed this formula. But do you really hanker after airport bookshop fame? The more mature debate has moved on to recognition and legacy (Simonton, 2016; Sternberg, 2016), but perhaps this too falls short. Are we too obsessed by measuring ‘scientific’ merit rather than rewarding work that leads to the wider betterment of people? Last month in these pages, Robert Sternberg spoke of ‘impact’, which the British government regulators define as consequences for the service of society. We all have to supply ‘data’ that fulfils that criterion, but that is very difficult to measure. Criteria tend to divide into three types of data: Observation, being the ratings of others (awards, references); Output (quality and quantity of papers); and Income. I am deeply suspicious of awards, having seen ‘close up’ how cabalistic, nasty and petty academics are. I am also unhappy about grants, as these are too often determined by fad and fashion. (A colleague suggested a measure called ‘taxpayer value-for-money’. One’s citation index is multiplied by 1000 and divided by grant money income. Why does it take Professor X nearly 10 times as money to achieve what Dr Y has done?) So perhaps the criteria that are least open to ‘distortion’ and ‘personal manipulation’ are citations, though those too have their detractors. Hurrah for the simple h or versions of it? Get into a new area early. Devise and validate a good psychometric test (of any sort). Do a few good meta-analyses and/or systematic reviews (and update them), making sure they cover all the papers for a set period. Get hold of a large longitudinal population sample to look at causal effects over time. Make sure the population is followed: this may take serious resources but literally 1000s of papers can result. Read the historical literature for inspiration and cautionary tales. Don’t chase fads, because by the time you get into this crowded space it will probably be too late. Inspiration comes from wide reading and curiosity. We know from the Just World literature that the rain falls on the just and the unjust alike. Some people deserve their recognition and fame. Others do not. The best you can do is have original ideas or theories; devise novel and robust measures; take stock of the literature; and help other people. Furnham, A. (1990). Quantifying quality: An argument in favour of citation counts. Journal of Further and Higher Education, 14, 105–110. Furnham, A. & Bonnett, C. (1992). British research productivity in psychology 1980–1989. Personality and Individual Differences, 13, 1333–1341. Simonton, D.K. (2016). Giving credit where credit’s due. Perspectives in Psychological Science, 11, 888–892. Sternberg, R. (2016). ‘Am I famous yet?’ Judging scholarly merit in psychological science. Perspectives in Psychological Science, 11, 877–881. Thorndike, R. (1955). The psychological value systems of psychologists. American Psychologist, 10, 787–789.